Want to get creative in your time with God? 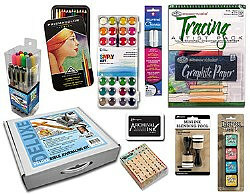 Bible journaling deluxe kit for expert journalers. Products tested to perform well on Bible paper with no bleed Bible safe ink. Products recommended by Illuminated Journaling author Jann Gray. Clear Gesso Soft Matte Artist Quality Primer 2 oz. All packaged in a reusable storage box with handle. Box size is 13.75" x 9.5" x 3.25". Deluxe Bible Journaling Kit by G T Luscombe is published by GT Luscombe and is our 6467th best seller. The ISBN for Deluxe Bible Journaling Kit is 634989345601. Be the first to review Deluxe Bible Journaling Kit! Got a question? No problem! Just click here to ask us about Deluxe Bible Journaling Kit.